It only takes a glance to recognize the 1960s. This extraordinary period’s unmistakable look and feel lives on in the movies and the music, architecture and design we still admire today. German design from the 1960s reflects the era and stands apart in a world of its own, stylish in a retro-modern way, elegant and independent. 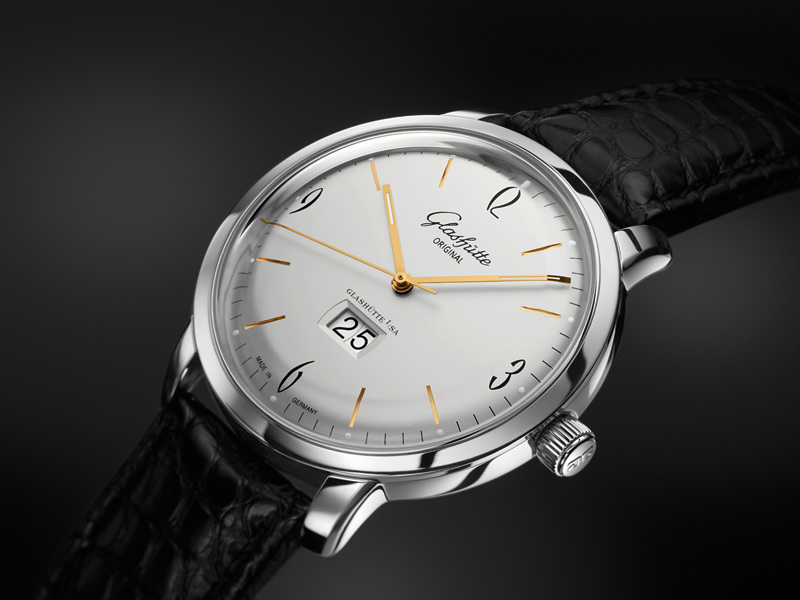 An authentic tribute to the spirit of the times, Glashütte Original’s Senator Sixties Panorama Date celebrates the most exciting and intriguing decade of the 20th century. The Senator Sixties Panorama Date combines unparalleled excellence in traditional mechanical watch making with a superbly evocative ‘vintage sixties’ design. Striking and stylish at once, the distinctive details and layout of the dial evoke the characteristic look of the nineteen sixties. The domed, galvanized black dial gives pride of place to the panorama date display and features exquisitely stylized silver Arabic numerals at hours 3, 6, 9 and 12, subtly complemented by a fine black minute ring. Gently arching, white gold hour, minute and seconds hands and diamond-cut hour markers enhance the simple elegance of the design. The shaped sapphire crystal case back first seen on the Senator Sixties models is a feature of the Senator Sixties Panorama Date as well, enabling a clear view of the Caliber 39-47 automatic movement and its oscillating weight, crafted in 21-carat gold. The polished stainless steel case and a finely-worked black Louisiana Alligator leather strap complete this superb 20th-century vintage design. The Senator Sixties Panorama Date is available with a galvanized black or satin-finished silver dial. 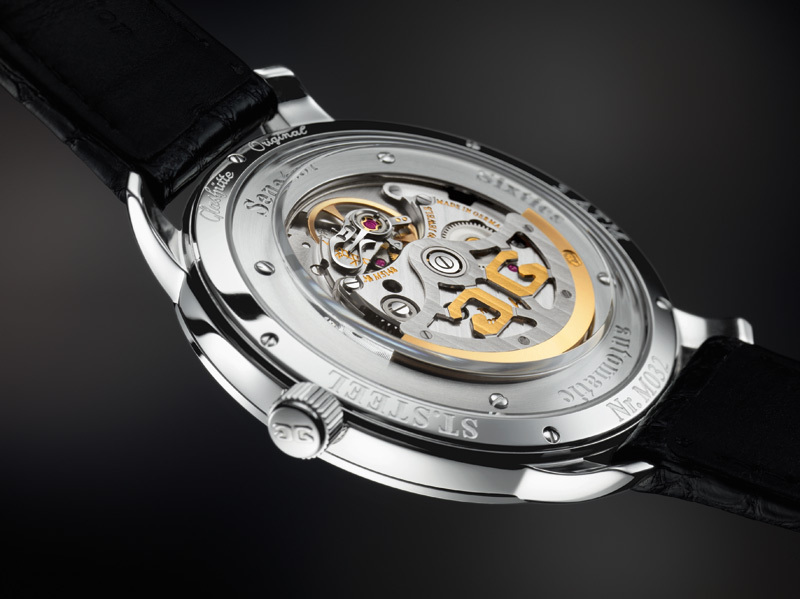 The black-dial version features silver Arabic numerals, white gold baton hour, minute and seconds hands and diamond-cut hour markers; the date is presented in white numerals on a black ground. The satin-finished silver model presents black Arabic numerals, rose gold hands, diamond-cut hour markers and the date in black on white. 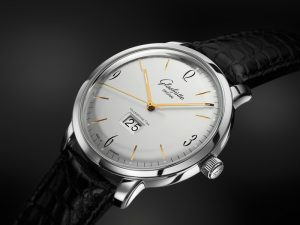 Automatic movement, hour, minute, second central, panorama date at 6 o’clock, hands rose or white gold with luminous, luminous spots on the hours, beveled edges, polished steel parts, Glashütte three-quarter plate with stripe finish, skeletonized rotor with 21-ct gold oscillation weight, swan-neck fine adjustment.